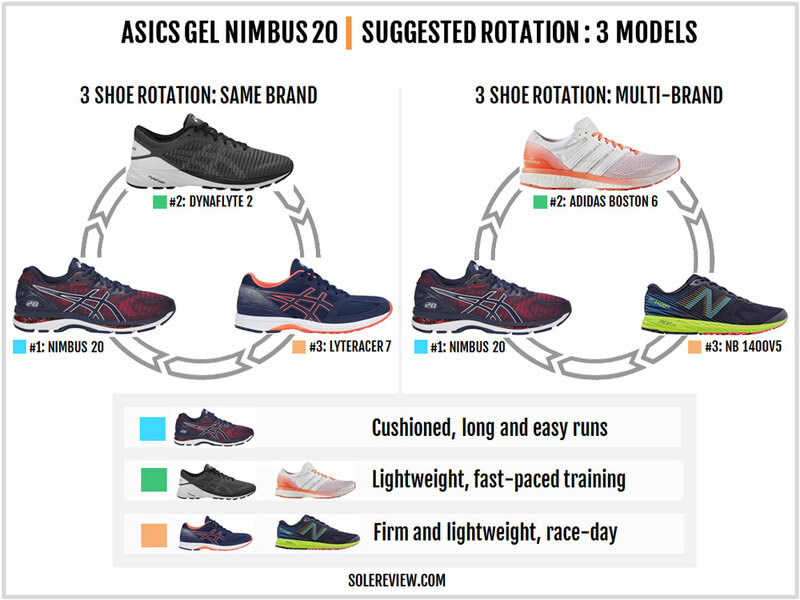 Asics’s marketing pitch: The Nimbus caters to runners of all levels. Upper: Engineered mesh, high-density printing, plastic heel clip. Midsole: Combination of Flytefoam and EVA foam, visible Gel under the heel and forefoot. 10 mm drop for men, 13 mm for women. Widths available: D - regular (reviewed) at the time of writing this review. The latetest Nimbus has the same medium-soft ride as the 19, but with a bit more forefoot room. Once upon the time, the Asics Nimbus used to be a very soft running shoe. This wasn’t a shoe you’d do a fast run in. Rather, the Nimbus was the footwear equivalent of a plush recliner, a shoe which felt more at home during easy and relaxed runs than blazing through 5k’s. Sure, some editions were much softer than the others. And yet, none of the Nimbus models were as firm as the version 19. Asics decided to infuse Flytefoam into the Nimbus, and the outcome was a noticeably firmer Nimbus. The Nimbus 20 has the same sole as last year, so nothing’s changed over the 19. Along with a firmer ride, the Nimbus got a narrower and shorter upper last year. The 20’s upper uses an updated mesh which makes the fit slightly more relaxed than the 19. That said, this is a relative comparison with the 19. If you’re upgrading from the Nimbus 18 and earlier, the 20 rides firmer and fits shorter. And if you’re planning to switch from the 19, our advice is to skip the 20. The ride quality is identical, and the upper fit change isn’t worth the price difference between the two versions. By the way, there’s also a ‘platinum’ edition of the Nimbus 20 available for a $30 upcharge. It’s the same shoe but with added visual bling – like the glossy, metallic heel counter combined with a subdued white/gray color scheme. Your first impression of the Nimbus 20’s ride quality will depend on your shoe history. If you’ve been running in the 19, then you can skip this section altogether. The 20 carries over the same midsole and outsole, so nothing changes. If your last Nimbus was the 18 or the 17, then the Nimbus 20’s transformed manners will come as a huge surprise. The pillowy ride which was long associated with the Nimbus is replaced by a firmer foundation. The firmness is due to Flytefoam, an EVA foam variant which is mixed with fibers. While it reduces the overall weight, the trade-off is the softness found in the earlier Nimbus versions. 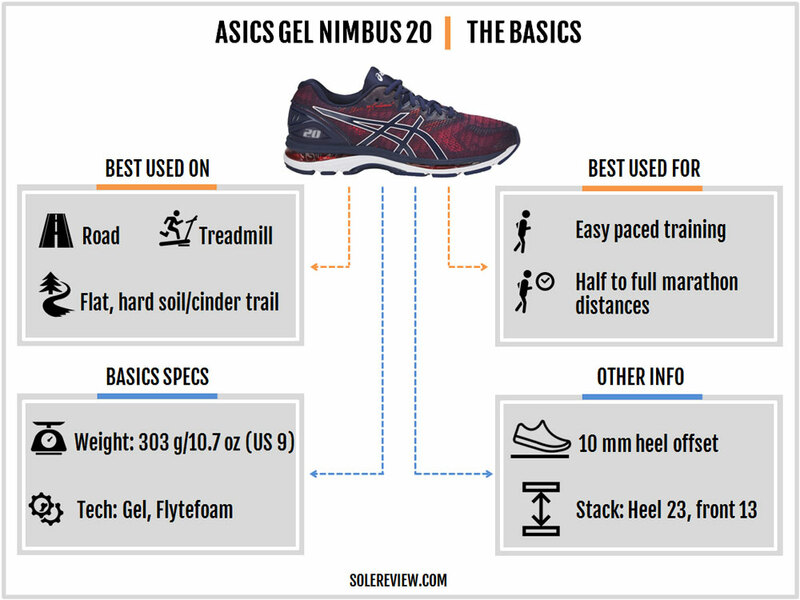 By far, the Nimbus 20 (and the 19) are the firmest among all the Nimbus models we’ve ever tested. Do note that the men’s and women’s Nimbus models have different stack heights. The Women’s Nimbus 20 has a heel which is higher by 2 mm, so the cushioning is softer than’s the men’s version. Asics calls this treatment ‘gender-specific’ cushioning. The softness is concentrated in the upper midsole. 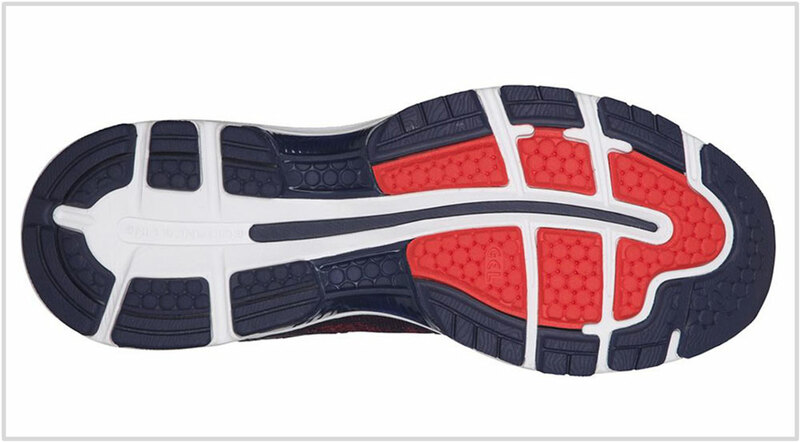 The drop-in Ortholite insole is squishy soft, and there’re a couple of additional foam layers below it. The visible Gel window located on the side also helps with cushioning. 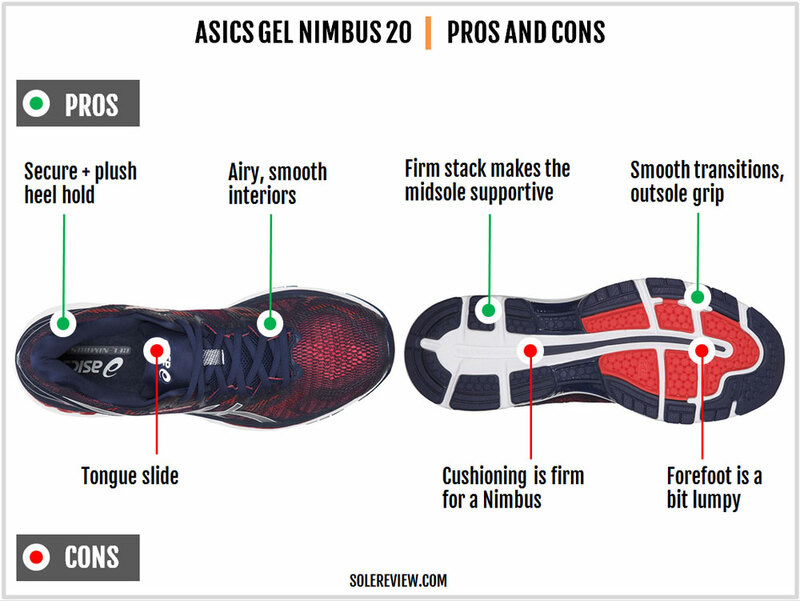 The Nimbus 20, like the 19, has a slight cushioning bias towards the outer midsole. The Flytefoam only forms a small part of the lateral midsole, so this side doesn’t compress as much as the inner side. The medial side has a lot of the firm Flytefoam and it is more supportive. But the bias isn’t upsetting, and the Nimbus 20 turns out to be fairly supportive. The outsole is generously articulated. The rearfoot outsole is made of multiple pieces, and there’s an area of exposed foam too. This helps the midsole splay better on impact (when rearfoot striking) and add to the cushioning experience. Transitions could have been better with a full contact outsole. 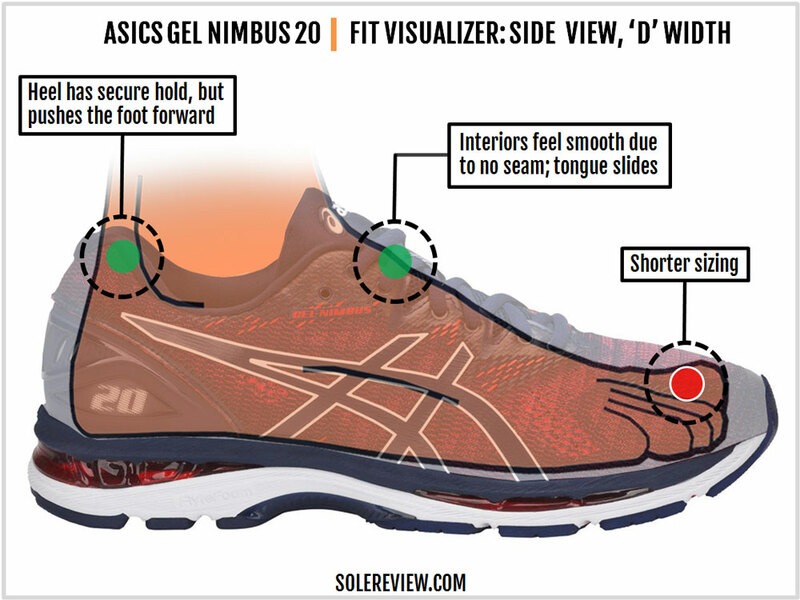 Since Asics uses a plastic midfoot shank, the transition isn’t as seamless as shoes with a filled up midfoot section. 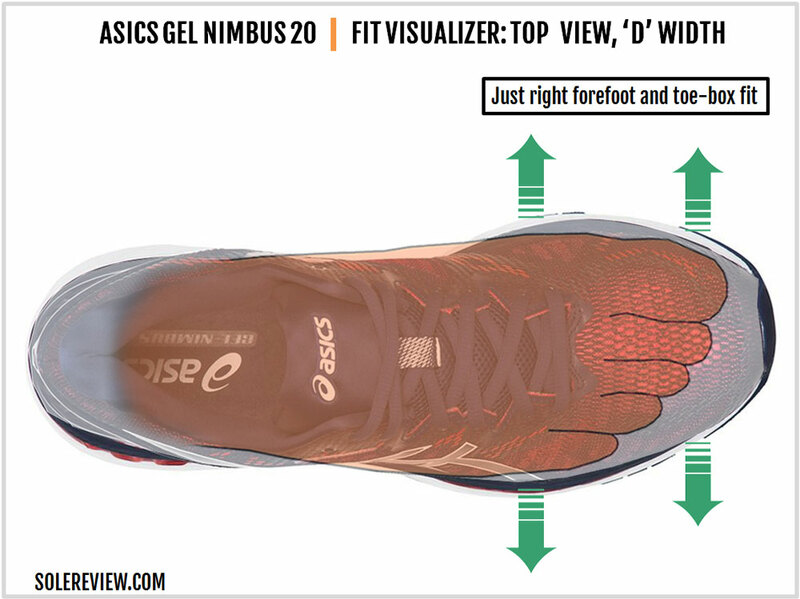 The ‘Guidance line’ splits the forefoot into two halves, so the Nimbus feels slightly lumpy. If you’re a forefoot striker, the outline of the outsole lugs can be felt underfoot. Due to the firmer Flytefoam, the sensation isn’t as bad as it once used to be, but still. The Flytefoam doesn’t have the springy rebound experienced in other midsole materials like adidas Boost or the Saucony Everun. 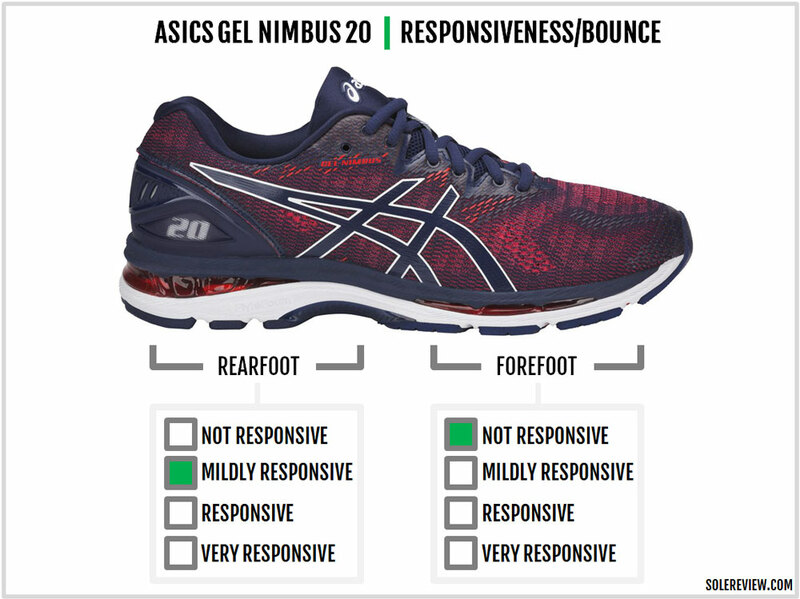 Asics claims that the Flytefoam has ‘exceptional bounce-back and responsiveness’, but that’s not true. What Flytefoam delivers is reduced weight and better long-term durability. A firmer Nimbus means a faster Nimbus. 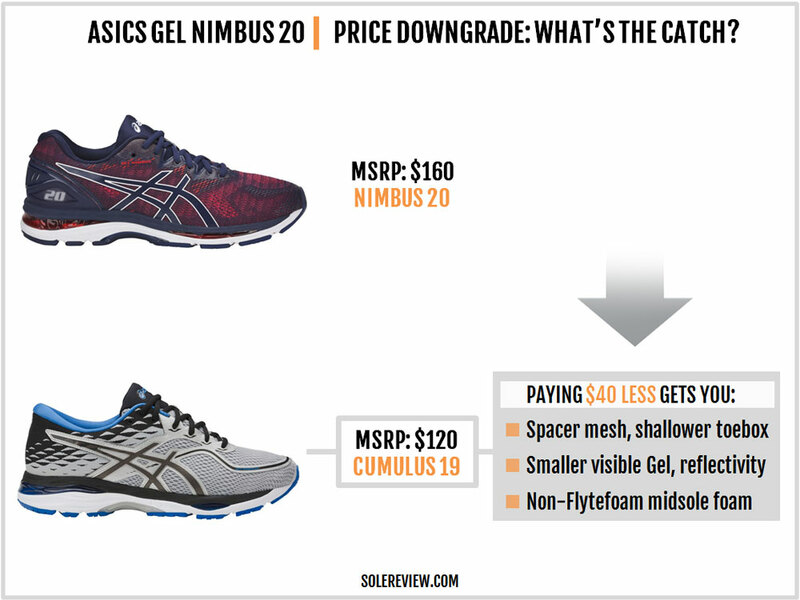 The 20 outperforms the versions 18 and prior in the speed department, but then, this begs the question – does the Nimbus need to be a firm shoe? After all, there are so many other shoes in Asics’s line-up which work great for faster runs. And if you wanted something less plush in the past, the Cumulus was the Nimbus’s wing-man. The Cumulus is still an alternative, but the cushioning gap between it and the Nimbus isn’t as wide as before. In our view, the Nimbus got the Flytefoam just for the sake of it. Because Flytefoam is available across the Nimbus running line no matter what the retail price is. This update changed the Nimbus as we knew it. So runners who loved the plush Nimbuses of old would find the v20 (and 19) an entirely different animal. If you’re looking for a soft and plush ride, the Nimbus 20 is no longer the shoe to deliver it. On the other hand, if you don’t mind the added firmness, the Nimbus 20 works great as a daily trainer and for longer races/runs. The Nimbus 20’s upper design is similar to the 19. A single piece of engineered mesh forms the exterior and is joined at the back by a heel seam. A plastic heel clutch provides structural support and is helped by plenty of plush padding. The tongue is unsleeved – cue tongue slide – and the semi-stretch laces have a soft feel. The engineered mesh has high-density printing like the 19 except for an updated visual scheme. So what has changed, and how does that affect the fit? The redesigned lacing area is one of the minor changes. The side panels now have a couple of grooves splitting the eye-stay. This makes the upper midfoot more flexible near the top, and this results in an improved lacing experience. The midfoot can now be cinched snugger than the 19. There are a couple of other important updates. The Nimbus 20 swaps the closed Jacquard mesh of the 19 with a more open structure. It is still an engineered mesh type with open and close-knit areas, but the forefoot has increased ventilation. The change of material makes the mesh more breathable and less restrictive. The forefoot gets more splay room. The new mesh opens up some space, and so does removing the inside logo. The Nimbus 19 had a fused logo on the inner upper. The 20 gets rid of it, and this relaxes the forefoot fit by a small margin. Makes no mistake; the Nimbus 20 still fits narrower and slightly shorter than some of the earlier (16, 17) Nimbus models. But when compared to the snug Nimbus 19, the 20 fares better. The interiors are smooth with no scratchy edges, so that’s a good thing. A minor downside of the new mesh is that it doesn’t hold its shape as well as the Nimbus 19’s mesh. As a result, the 20’s silhouette looks a bit droopy in the forefoot. This doesn’t affect the shoe’s functionality, but some discerning runners might notice it. The heel grip is excellent. The plastic heel clip locks the foot in place, and the plush padding makes the interiors comfortable. This is the same lining which is used on the tongue flap too. The reflective elements have been re-arranged on the counter, with some of it now over the heel center. 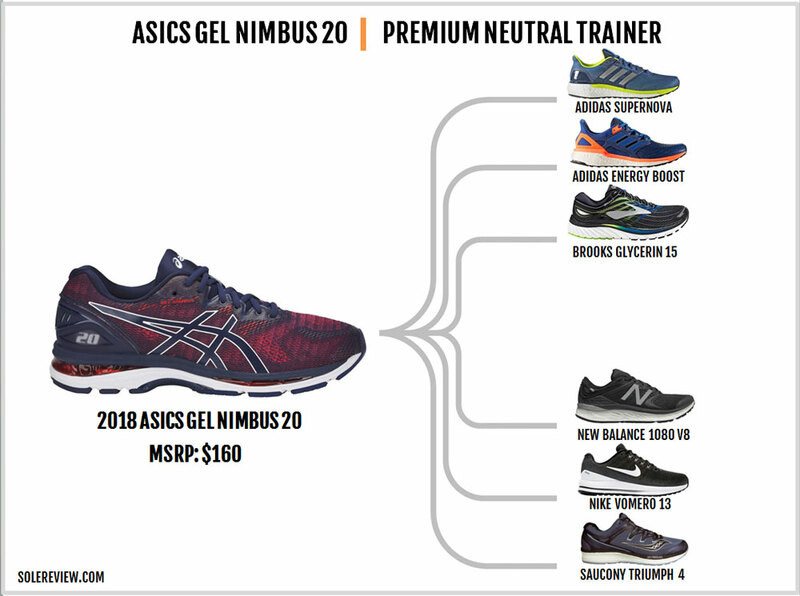 The Nimbus 20 is lighter than the 19 by 0.4 ounces, and all of that gain comes from changing the mesh and removing one of the side Asics logos. 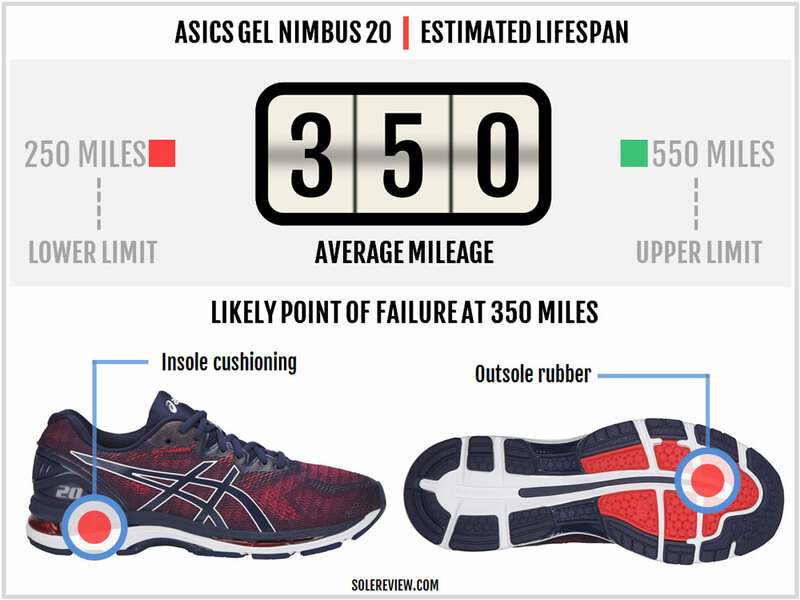 The Asics Nimbus 20 is expected to deliver a standard durability level of over 300 miles. There will be the usual wear and tear areas like the outsole and foam insole. Though the upper has a lighter build quality than the Nimbus 19, it’s too early to report anything from a durability perspective. Except for the tongue slide, the Nimbus 20’s upper fits well. The interiors are smooth and well ventilated. 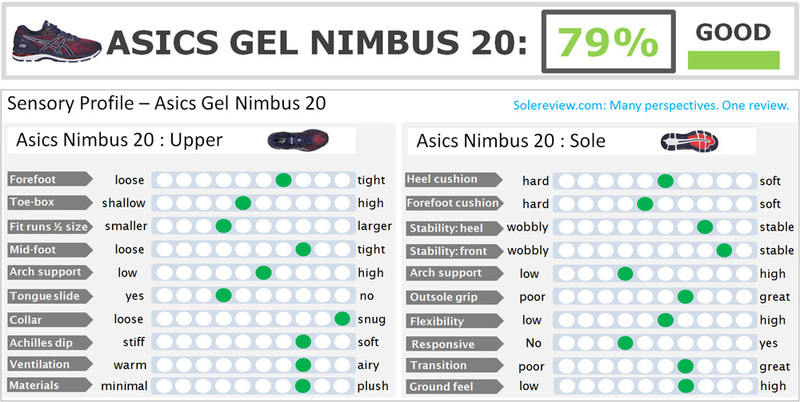 And for all its Gel and plastic counter, the Nimbus 20’s scores well on weight. The medium-soft ride is supportive, and the transitions are smooth for what is marketed as a cushioned daily trainer. As with most Asics shoes, the Nimbus’s un-tethered tongue tends to move around. Also, the guidance line under the forefoot should be a tad narrow – doing so will completely eliminate the lumpy feel produced by the outsole edges. And the last one is subjective. Our opinion is that the new firmed up ride isn’t representative of the Nimbus franchise. When runners buy the Nimbus, they do so to get an ultra-soft ride experience. This is missing on the Nimbus 19 and 20. For $40 less than the Nimbus is the Cumulus 19, another popular neutral running shoe. It’s good value for those who want a cushioned ride but don’t want to pay the Nimbus markup. The Cumulus hasn’t been Flytefoamed – yet. So as far as the cushioning softness is concerned, there isn’t a lot of difference. Most of the difference between the two is felt in the upper. The Cumulus uses materials which isn’t as plush as the Nimbus. Due to the use of synthetic overlays, the Cumulus outweighs the Nimbus by nearly half an ounce. Our recommended three-shoe assortment is as follows. 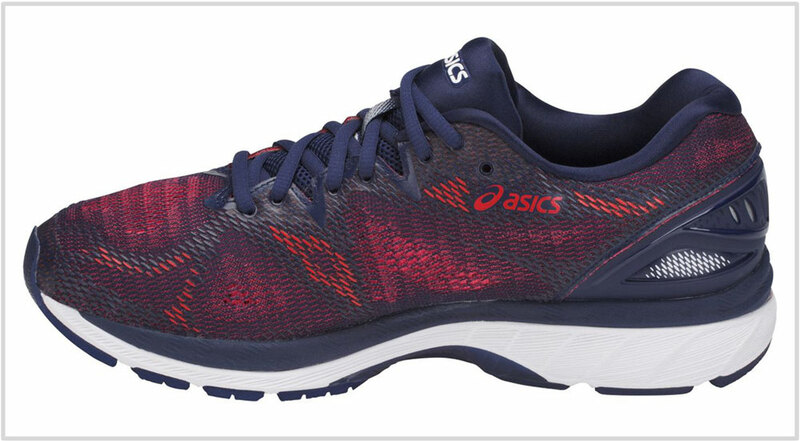 Get the Asics Dynaflyte 2 if you need a cushioned and lighter shoe for fast training runs. 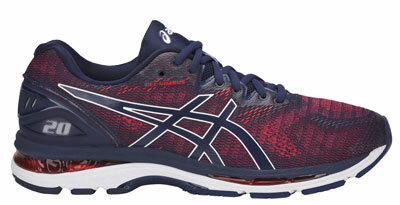 Complement that with the Asics LyteRacer TS7 for race-day use. The excellent adidas Boston 6 and the New Balance 1400V5 are also great choices outside Asics for fast runs and races respectively. The price-band which the Nimbus 20 represents the crème de la crème of premium neutral trainers. You have a lot to choose from. The Adidas Energy Boost and Supernova have a soft and responsive ride thanks to the thick stack of Boost foam. If a smooth, plush, and supportive ride is what you’re after, the Brooks Glycerin 15 has it in spades. The Nike Vomero 13 combines a cushioned and springy ride, while the Saucony Triumph ISO 4 has a supportive and responsive ride. 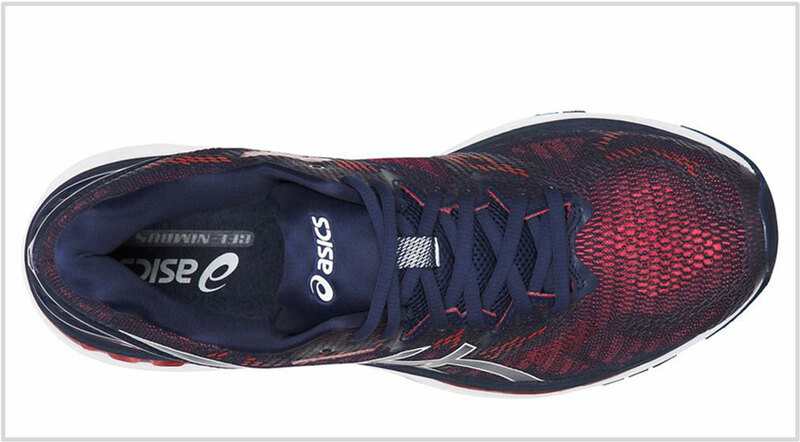 Runners who like New Balance’s Fresh Foam platform have the 1080V8 as an option. Mizuno loyalists will find their premium neutral cushioning experience in the Wave Sky.